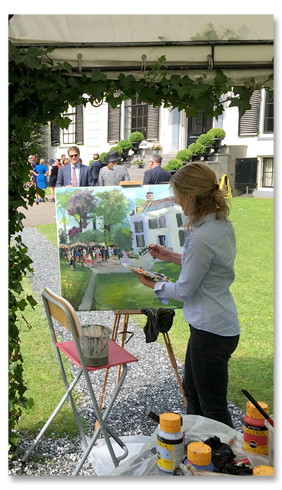 An impression of your special day playfully coming to life on canvas…! As a live painter I make a painting -live- on the spot. This could be at your wedding day, birthday party or business event. In about 4 hours I paint a unique and personal impression on canvas of this day. Your guests can see the different stages of the painting coming to life. A real ‘how it’s made’ on location. This way live painting is the ideal combination of art and entertainment. Beforehand we will discuss your wishes for the painting. The standard size is 70 x 100 cm, It’s possible to request another size painting. I use acrylic based paint that dries quickly, therefore you can take your painting home the same evening. 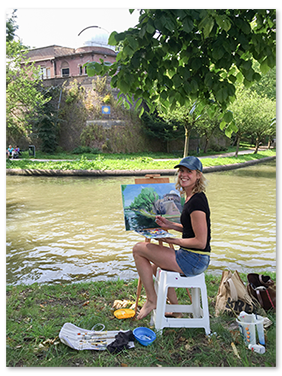 A live paint is perfect to give with friends as a gift or surprise your guests! Email me or give me a call for a quote and more information. A mural in your office could leave a really nice impression on your clients! With a beautiful logo or lifesize handpainted view on your wall for example. Murals can be painted anywhere and there are lots of possibilities… In the first stage I will make some sketches and show you how the result will be. We can integrate your ideas and choose the best design together. Murals can give your room a personal touch and bring it to life. Some murals will feel like you can just walk in to another world. This is also called ‘trompe l’oleil’, and means optical illusion. 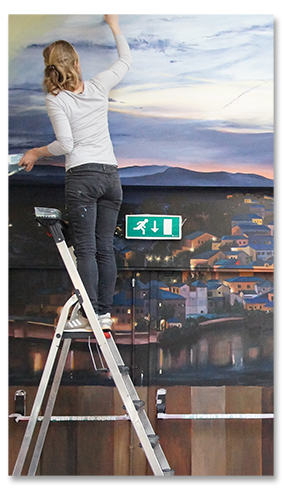 Examples of murals can be your favourite holiday destination, mountain view or all kinds of illustrations. Everything is painted by hand, this way the possibilities are endless and you won’t have to deal with the limitations of a photoprint. A photoprint will never have the same impact as a mural can have. Another advantage of a mural is that I can paint around corners or on top of doors or ceiling. I paint with high quality acrylic based paint. This paint will dry quickly and doesn’t smell. The room can be used directly after the painting is finished. It is possible to finish the mural with a varnish to protect it against fading and scratches, it’s also easier to clean when a varnish is applied. For Yoghurtbarn I design all the visuals. At the moment Yoghurtbarn has over 10 stores in the Netherlands and in 2018 they won the title Marketing scale up of the year. I also design and write menuboards by hand. For other clients I design offline print work, logo design and handmade birth announcements.